Everything happens for a reason and that (heart defect) was a symbol that maybe I’m being used for other things. It’s crazy that 12 years ago (February 14, 2006) I had open heart surgery and was told the chances of playing sports would be far too great to achieve. And yet I’m here living out the dreams I once set out to accomplish and encouraging kids who have gone through the same journey as I did, that it can be done. 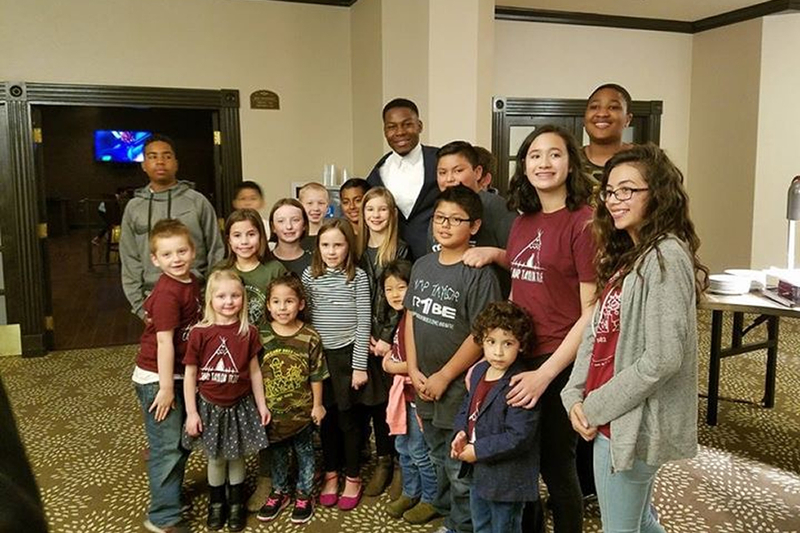 Take A Chance: Be a HEART WARRIOR is a signature program which inspires children who have Congenital Heart Disease (CHD) to become a “TJ Carrie Heart Warrior”. A warrior by definition means, “a brave or experienced fighter or soldier, one who is engaged energetically in an activity, cause, or conflict.” TJ encourages the children to Be Brave, Be Strong, Help Those in Need, and to Work Hard. 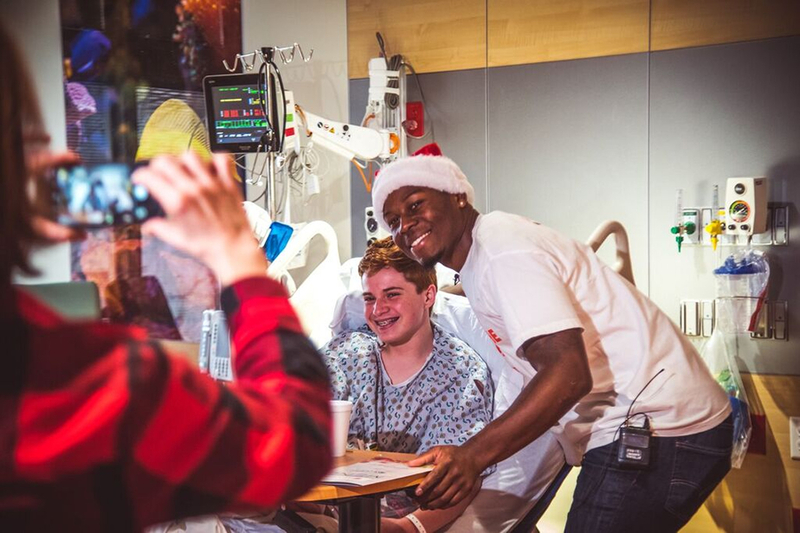 And that is the “TJ Carrie Heart Warrior” battle cry. Together, they will go to battle and overcome the fears and uncertainties that children with CHD face each day. I love to see Camp Taylor heart children listen to T.J. share his own life experiences in enduring through open heart surgery during his time in high school. Despite the incredible setbacks, he was blessed to continue chasing his dreams and succeeding. T.J. brings a refreshing message of hope that some dreams still can be fulfilled despite this life-threatening disease. My favorite moments are those when he lifts his shirt and the kids compare their scars with T.J. When an athlete steps forward to help the children they feel acceptance on a greater level and somehow that translates to being somewhat normal. That far-fetched feeling of feeling normal is a priceless gift easier given by one that has journeyed down the same path. We are always eager for T.J. to come spend time with our children. The MCore Foundation has been dedicated to providing free cardiac screenings for students regardless of financial circumstances since 2014. The mCORE Foundation partners with numerous organizations and other foundations to raise funding and create awareness in our communities about Sudden Cardiac Arrest. 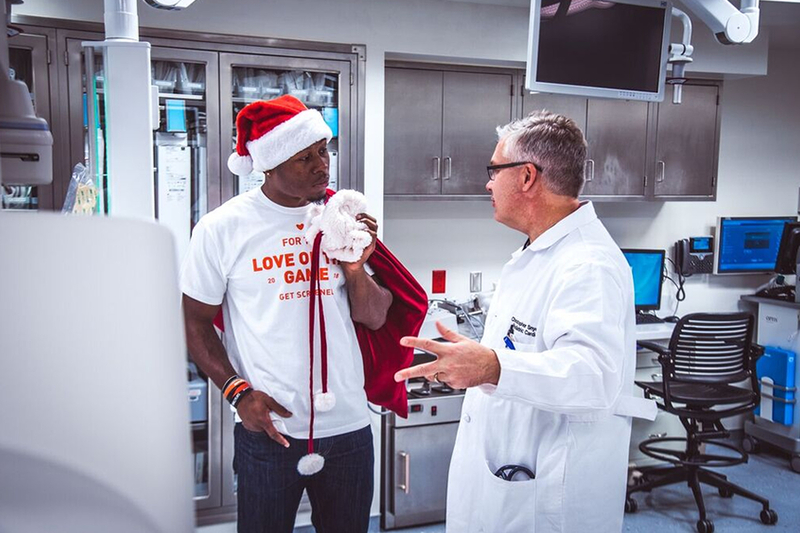 The TJ Carrie Foundation has partnered with MCore Foundation to provide cardiac screenings to area student athletes. Chatalyze is a Silicon Valley-based technology startup. This personal engagement platform allows athletes to personally and easily connect with their fans around the world. This is accomplished through our enriched video conference technology, which enables athletes to chat one-on-one with multiple fans in a single chat session, sign digital autographs in real time, and take “screenshot selfies.” The company’s goal is to make athletes more widely and personally available to their fans so that fans can experience “magic moments” on a regular basis. Our objective is not to replace traditional in-person autograph signings and “meet and greets,” but to offer an alternative to when the athlete is not available for a personal appearance. 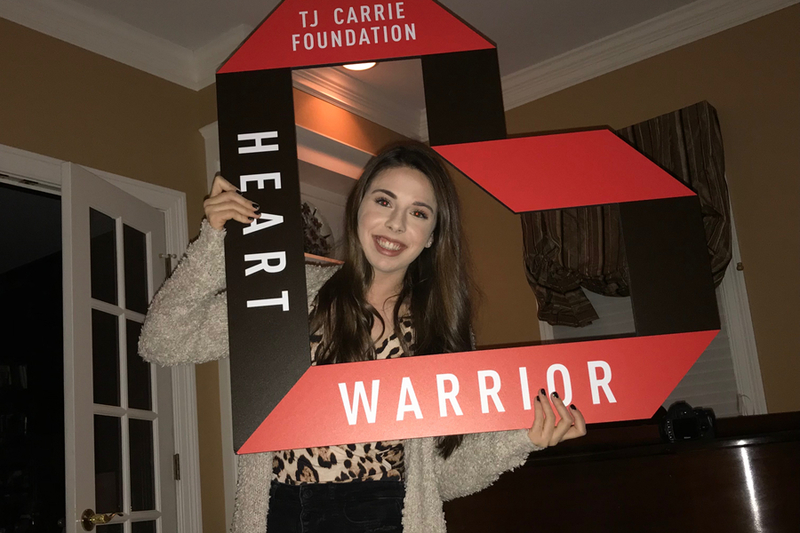 Carrie launched Chatalyze with local hospitals to offer a Heart Warrior message to those patients who are in the hospital. The Shadow Buddies Foundation is dedicated to providing support and knowledge to children with severe illnesses and disabilities. The Foundation accomplishes this through unique programs designed to enhance the lives of children and adults by fostering compassion and awareness of differences with a line of 31 condition-specific “Shadow Buddy” dolls. Shadow Buddies offer seriously ill or medically challenged children the companionship of a friend “just like me.” To date, more than 1M Shadow Buddies have been distributed world-wide. 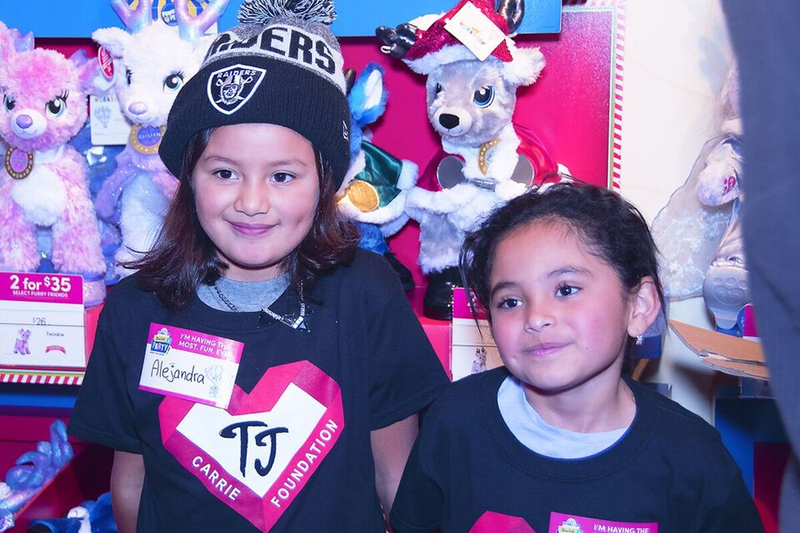 Shadow Buddies have created the TJ Carrie Heart Buddy with personalized Heart Warrior t-shirt and matching NFL shorts that he personally donates to children. Camp Taylor camp programs have hosted thousands of Stanford Children’s Hospital heart patients over the past 16 years. Camp Taylor continues to set the pace for medically supervised camp programs across the United States answering to the needs of the under-served pediatric cardiac community. The mission of Camp Taylor is to create positive, self-affirming experiences in the lives of children with heart disease. CT is successful in this endeavor by providing educational and fun camp programs to heart children and their families. “In the WORLD of Camp Taylor, Fun tackles Fear, Friendships bloom fast, and Scars are Badges of Honor. Every day that I get to play the game I love is such a blessing! Sometimes you don’t appreciate how much the game means until it’s almost taken away from you. I’ll never forget trying out for the De La Salle High School football team my sophomore year. Growing up with four older brothers who played collegiate football, I had always dreamed about putting on those pads and that helmet and playing under – the Friday Night Lights, baby! But on the first day of tryouts, my life changed forever. It was hot. We were working hard. I was sweating. I remember I was trying to catch my breath … Click here to read more!